Pocket Naturalist: Dangerous Animals & Plants, 2006, by James Kavanagh, illustrated by Raymond Leung. Compact, laminated nature guide, profusely illustrated in color. 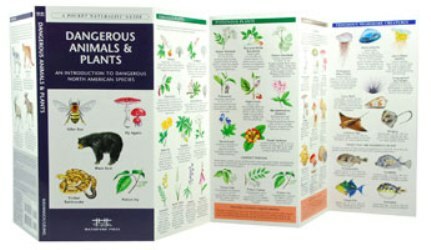 Shows over 90 dangerous North American species of poisonous plants and mushrooms, nearshore creatures, fishes, insects, spiders, sharks, snakes, other reptiles and mammals. Folded to 4” x 8 ¼,” opens out to six 4” panels.